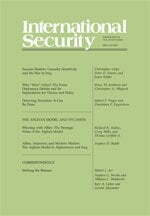 John M. Schuessler, “The Deception Dividend: FDR’s Undeclared War.” International Security 34:4 (Spring 2010): 133–165. DOI: 10.1162/isec.2010.34.4.133. http://dx.doi.org/10.1162/isec.2010.34.4.133 . Reiter and Stam take it for granted that as democratic states decide whether to go to war, vigorous, open debate will play a key role in the decision-making process, but they are by no means the only international relations scholars to assume that in democracies the public dimension of policy-making is of fundamental importance. That sort of assumption, in fact, lies at the heart of some major arguments about how domestic institutions—and especially democratic institutions—shape international outcomes. It is important to recognize, however, that it is just an assumption. It is by no means obvious that that view of policy-making in democracies as a largely open process is in fact correct. And the real point of the Schuessler article, it seems to me, is that assumptions of that sort are very much open to question—that one has to wonder whether the “open marketplace of ideas” (to use a term from the Reiter and Stam book) is as important as many scholars seem to think. To be sure, Schuessler’s argument in this article is framed in very moderate terms. He does not really challenge the basic argument that Reiter and Stam make in their book (about why democracies tend to win their wars) head on. He says he is just interested in looking at what happens when the sort of mechanism those writers have in mind—the mechanism that leads democracies to “select” wars they can easily win—breaks down. What happens, he wonders, when political leaders are drawn to wars where easy victory is by no means guaranteed? Will public opinion, in those cases, prevent those leaders from taking the country into war? And his argument is that in those cases democratic constraints can be evaded; leaders might be able to manipulate the domestic political process by misleading the public about what their real policies are and “shifting blame for hostilities onto the adversary” (143). But in doing this Schuessler is not just pointing to a relatively unimportant set of cases that happen to lie outside the reach of the Reiter-Stam theory. The cases he has in mind—the cases where the political leadership thinks it might have to take the country into a difficult war—are the cases we are likely to find of greatest interest. World War II certainly counts for a lot more in our thinking about these issues than, say, the invasion of Grenada. And I think it is important to note that Schuessler’s argument does contradict what Reiter and Stam have to say in some fairly basic ways. They feel that the public really is in the driver’s seat—that “for better or worse, democratic foreign policy is driven by public desires.” The political leadership, in their view, cannot really manipulate public opinion: “Though democratic leaders can sometimes shift public opinion at the margins, in general it is more accurate to think of the public as controlling the actions of its elected leaders rather than dancing on strings pulled by the leadership as puppet master.” They admit that democratic leaders will often act “covertly or deceptively to circumvent public constraints or sidestep public debate,” but only when “the anticipated scale of an operation is sufficiently small.” Such tactics, they say, cannot be used when the stakes are relatively high: if it is a question of actually going to war (as opposed to just engaging in some covert operation), the moves the government makes would be “subject to the skeptical approval of the population and the bright light of public scrutiny.” For Schuessler, on the other hand, those “public constraints” are relatively weak. In his view, the political leadership might be able to “sidestep public debate” even when major action is contemplated; they can do so, he thinks, by resorting to a strategy of deception. The real issue here is thus not whether a democratic government is capable of misleading its own people. As Reiter and Stam themselves point out, “cases of covert action and the deception of the voting public abound.” The real issue has to do with how deep a shadow deceptive tactics can cast on the process by which a democracy goes to war. Can a government, through the use of such tactics, take the country into a war that the citizenry, if the issue had been put to them in an open and honest way, would not choose to fight? If so, all the arguments one finds in the literature about the transparency of the policy-making process in democracies and the importance of an “open marketplace of ideas” in such countries might have to be taken with a grain of salt. This is a subject that I have written about and Schuessler draws on some of the arguments that I made. So I cannot claim that I am giving a truly independent assessment. But I certainly agree with the main thrust of Schuessler’s argument on this issue. Suffice it to say that to my mind the argument that Roosevelt deliberately put the country on a collision course with Japan is quite compelling; the claim that he did so in order to bring the country into the war with Germany is more speculative, but still quite strong. That is my view, of course, and few historians would go that far. But let us suppose that Schuessler’s (and my) interpretation of Roosevelt’s policy in 1941, not just vis-à-vis Germany but vis-à-vis Japan as well, is correct. What does that tell us about the issue of deception? Does all this mean that FDR was basically able to hoodwink the country and take the nation into a war that most of it really did not want to fight? Or to put the issue another way: how deeply was the policy process affected—many would say “tainted”—by the particular tactics that Roosevelt used? The issue here is more complex than one might think. There were certainly points at which Roosevelt led the public to think that he was more committed to keeping the country out of war than he in fact was. The 1940 Boston speech, which Schuessler refers to, is a good example. But when you look at the larger picture, the impression you get is rather different. I remember being amazed, for example, when I read Roosevelt’s speeches and fireside chats, especially those given in the period right before Pearl Harbor. I had thought they would be full of talk about how important it was to stay out of the war, but that assumption turned out to be totally wrong. His arguments pointed in exactly the opposite direction. America, he said, could not afford to think in purely defensive terms; she could not afford to pursue an essentially passive policy and take no action until she herself was attacked. Hitler, he assumed, had to be defeated; the Nazi threat, he said, had to be “struck down.” He was certainly not totally open about what he was doing, especially at the operational level, but it is not really correct to say that on the question of whether he wanted to take America into the European war, the country was being hoodwinked. there was (and remains) a curious pact between presidents and the public. In essence, Americans (and those in other “democracies”) expect and insist that their leaders make the hard decisions. Don’t ask us to go to war, just do it and hope it comes out OK. It is hard to read U.S. newspapers and magazines during 1940-41 without concluding that the American public sensed, understood, was informed about, recognized, accepted (choose your favorite words) the general direction of FDR’s policies. But just don’t ask us to make the hard decision. That’s what we expect leaders to do. use an adult version of the children’s taunt—“ask me no questions, I’ll tell you no lies.” Even the unsophisticated polls of that era (FDR occasionally suggested questions for the pollsters to ask) demonstrate that by mid-1940 those questioned understood quite well what was at stake—but refused to ratify the hard decisions. That only illustrates the role leaders are expected to play: to make unpleasant choices and then take the blame. What Americans wanted to hear in 1940 (and in subsequent crises) was not what they knew was the truth, but what they wished were the truth. In a sense, they wanted to be lied to. Kimball is basically talking here about the policy of taking the country into the European war. He by no means accepts the “back door” argument about FDR’s policy toward Japan. But even if we just look at the purely European side of the policy, we can still ask what light the story tells us about the theoretical issues at hand. Was what happened in 1941 to be understood, for example, as a case of the “manufacturing of consent”? Well, not quite: the real feelings of ordinary people still played a key role. But one cannot go to the other extreme either: the whole concept of an “open marketplace of ideas” does not really capture what was going at the time. What you had was a complex process that was partly political and partly intellective, in which certain elements of deception and half-deception and perhaps even self-deception came into play. And if you accept the “back door” argument you can go further still. The element of deception looms much larger: FDR was stage-managing events so that the American people could feel that if they had to go to war, it was only because they themselves had been attacked, whereas the real story was by no means that simple. So what sorts of conclusions are to be drawn from the whole story of America’s road to war in 1941? Major theoretical arguments about democracy and war are built on the assumption that in democracies vigorous public debate plays a key role in shaping foreign policy outcomes. But the process is not nearly as transparent as a number of leading theorists seem to think. Deception can certainly play a major role, as Schuessler argues, when political leaders are drawn to policies which they know will not garner massive public support. If there is a gap between what they want to do and what the public will happily sanction, a strategy of deception might enable them to bridge it. Indeed, they might be able to stage-manage a process that brings the country into a war that the leadership feels is necessary, but which the bulk of the population would not choose to enter if the arguments were put to them in an honest and straightforward way. One can find a gap of this sort not just in democracies but in virtually any political system. A nation’s leaders live in the international world and their thinking is in large measure shaped by the imperatives of that sort of world—and especially by the pressure to think in relatively amoral, power political terms. But they also live in the world of domestic politics, and that means that they have to package their policies in a way that corresponds to their country’s particular political culture. So a certain element of dishonesty is built into the very structure of the system. But the problem, if one wants to call it that, is particularly acute in the case of democracies. It is precisely because public opinion is so important that leaders feel under so much pressure to pander to it by framing their policies in a way that their own societies will find palatable. It certainly cannot simply be assumed that the policy-making process in democracies is transparent, or even that it is more transparent in democracies than in other sorts of regimes. But what difference does all this make? Doesn’t it simply mean that the ability of political leaders in democracies to use deceptive tactics increases their freedom of action and enables them to behave like the leaders of other kinds of states? Doesn’t it mean that the kind of foreign policy democracies pursue is no better and no worse than the sort of policy other states would pursue? The 1941 story, to my mind at least, points to a very different conclusion. If in fact Roosevelt had to put America on a collision course with Japan because that was the only way to bring the country into the European war fast enough—if the fact that America was a democracy meant the country could not bring itself to go to war as an act of policy but would only go in if it itself were directly attacked—then that would mean that thanks to its political system America ended up fighting an essentially unnecessary second war with Japan. In other words, if one accepts the argument about 1941 that Schuessler (and I) make, then one tends to view arguments about how well democracies do in international politics with a certain degree of skepticism. And for me at least, the old line of argument about democracies and foreign policy developed by conservative critics from Castlereagh to Kennan is still quite convincing. From the point of view of the international system as a whole, the fact that its most powerful member is a democracy has by no means been an unalloyed blessing; as a nation, we are not doing ourselves a real service by pretending otherwise. Marc Trachtenberg, a historian by training, is currently a professor of political science at UCLA. He is the author of a number of works on twentieth century international politics, most notably A Constructed Peace: The Making of the European Settlement, 1945-1963 (1999). Dan Reiter and Allan C. Stam, Democracies at War (Princeton: Princeton University Press, 2002), 23, 146. Kenneth Schultz, for example, in his very elegant study Democracy and Coercive Diplomacy explicitly assumes that in democracies “the state is not a black box, but a transparent or open box into which outside actors can look for clues about the government’s motivations and constraints.” His basic argument is that “open deliberation and debate, essential for representation and accountability domestically, have profound effects on whether and when democratic governments can effectively use threats of force to prevail in international crises.” Kenneth Schultz, Democracy and Coercive Diplomacy (Princeton: Princeton University Press, 2001), 1-2, 57; see also xiii and 231-232. Reiter and Stam, 145. Note also what they say on p. 144: “Democratic decisions for war are determined and constrained by public consent.” Emphasis added. Schuessler quotes some of the key phrases, but the full document, Churchill’s report to the Cabinet on his meeting with Roosevelt in Argentia, is available online: W.M. (41) 84th Conclusions, 19 August 1941, CAB 65/19, “most secret” typewritten attachment, http://filestore.nationalarchives.gov.uk/pdfs/large/cab-65-19.pdf, frames 208-210. For the evidence and reasoning that these conclusions are based on, see Marc Trachtenberg, The Craft of International History: A Guide to Method (Princeton: Princeton University Press, 2006), chap. 4, and the briefer account in Marc Trachtenberg, “Preventive War and U.S. Foreign Policy,” Security Studies 16:1 (January-March 2007), 22-29. I should note, however, that the chapter in the methods book is not a standard historical study. My goal there was to show how you could reach major conclusions about some important historical issue just through careful study of the secondary sources supplemented by some highly targeted research in readily available primary sources. The conclusions I reached were by no means based on exhaustive archival research, and in fact when I studied the issue I didn’t do any archival work at all. I think a lot of work remains to be done on the origins of the U.S.-Japanese War; many important questions remain unanswered. Warren Kimball H-Diplo post, 22 September 1999. Warren Kimball, “Franklin D. Roosevelt and World War II,” Presidential Studies Quarterly 34:1 (March 2004), 98.